Women’s Flyweight: Following Liz Carmouche’s victory over Jennifer Maia, Carmouche has moved up from #7 up to #4. Roxanne Modafferi, Lauren Murphy, and Katlyn Chookagian moved down to #5, #6, and #7 respectively. Also, Paige VanZant is barely clinging on to her title as a “ranked fighter” dropping from #14 to #15, with Montana de la Rosa moving up to #14. Flyweight: Dustin Ortiz moved up a spot to now be tied with Brandon Moreno at #9. Bantamweight: Following his victory over Eddie Wineland, Alejandro Perez moved up from #13 to #12. Thomas Almeida is now at #13 and Douglas Silva de Andrade debuted in the rankings at #15. Also, Pedro Munhoz moved up to #9, which dropped Cody Stamann to #10. 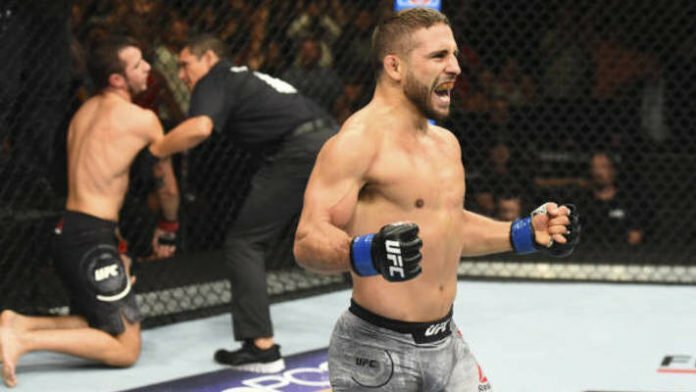 Featherweight: The biggest jump in all of the rankings came to the returning Chad Mendes, which saw him also return to the rankings all the way up to #7. This caused a lot of shuffling around, with Mirsad Bektic, Chan Sung Jung, and Renato Moicano each dropping down a spot from #8-#10 respectively. Also, Alexander Volkanovski’s insane 15-fight win streak has landed him at #11 after defeating Darren Elkins, who now sits at #13, with Ricardo Lamas at #12. Zabit Magomedsharipov is now at #14, with Myles Jury now removed form the rankings. Lightweight: Nate Diaz was tied for #8 with Anthony Pettis and now is ranked #9. Heavyweight: Following his main event victory over Blagoy Ivanov at UFC Boise this past weekend, Junior dos Santos moved from #8 to #7, knocking Mark Hunt down to #8. Pound for Pound: Last week, Conor McGregor and Max Holloway were tied for #3, now Holloway sits at #3 alone while Conor McGregor is now at #4. Also, Tyron Woodley moved up to #7, replacing Stipe Miocic who now sits at #8. What are your thoughts on this week’s rankings?